Green roof systems and roof gardens look great in an urban landscape, but they’re not just for cities anymore. They’re worth a look anywhere cooling costs or flooding from stormwater runoff are a problem. After strengthening the framing as needed to bear some extra weight, most green roofs start with a heat-deflecting white rubber membrane roof. A plastic grid system planted with low-maintenance groundcover plants like sedums or grasses sits on top. The plants’ natural evapo-transpiration and the insulation they provide helps cool the building. They absorb most of the rainwater that otherwise might wind up in your basement or overloading the sewer system. In our increasingly paved environment, green roofs provide a habitat for birds and even space for gardening. 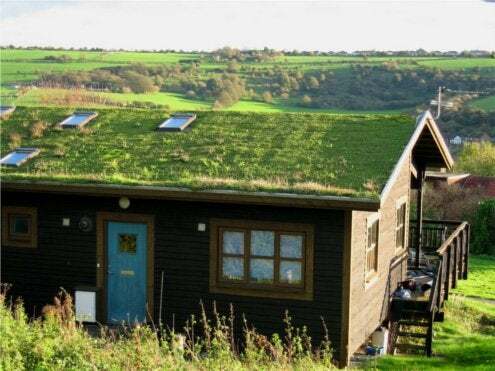 You don’t have to have a flat roof to have a green roof. There are pitched-roof systems that use cleats and mesh to hold the planting medium in place without compromising the membrane roof with fasteners. Sedum mats are now sold like sod, so you don’t have to wait long for your roof to come into full bloom!